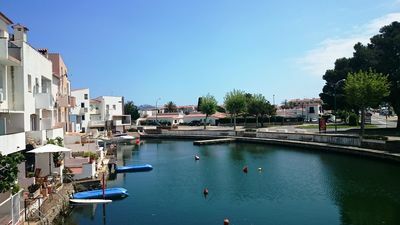 Casa Isabella is a perfect holiday villa and location (please read our Guest Reviews) which is ideal for families/couples. 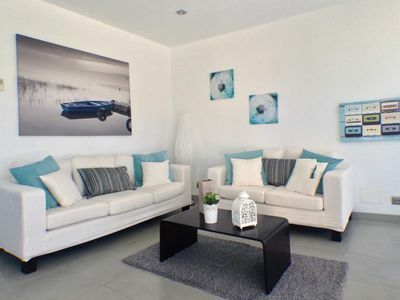 There are THREE bedrooms and a very large lounge/dining room.There is a private pool with outside shower and sun terrace/loungers..perfect for those seeking holiday sun and peace in this most beautiful coastal region of the Costa Blanca North. 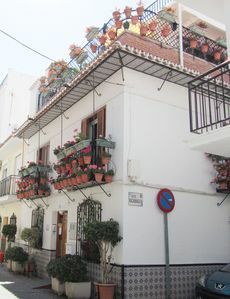 The villa is very comfortable and is an easy walk to beaches,cafes, bars and a range of restaurants to suit all tastes and pockets.There are two major supermarkets just minutes walk from the villa covering every shopping need. 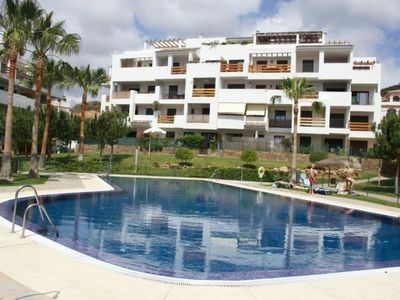 Moraira centre is a 20 minute walk or just 5 mins by car. The villa offers car parking behind secure gates and 'on road', if necessary. Our villa is a south facing (sun all day!) detached villa with an adjacent self-contained new build annex, all on flat ground. 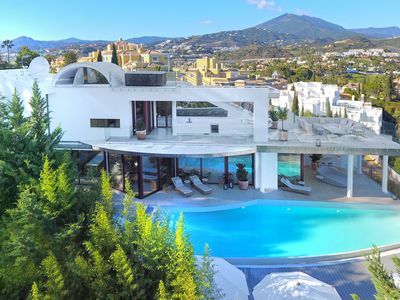 The villa is positioned on a large corner plot (over 1000M2) in a beautiful, well-maintained Mediterranean garden with many palm trees and cacti. The private and secluded, kidney-shaped pool (10x8) has a quality outside shower and there are high quality sun beds plus large oval table, chairs(6) and big parasol. 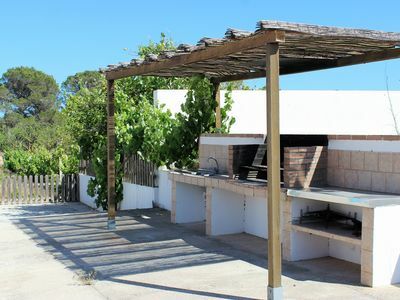 There is an adjacent BBQ (charcoal) area plus several terraces/nooks and crannies around the property for relaxing or dining including an 'upper deck' sun terrace with wonderful Mediterranean blue sea and various mountain range views just 'perfecto' for early evening cocktails and hors d'oeuvres! The main villa has 2 bedrooms, one with a King bed and en suite, the other a King bed with adjacent bathroom with twin basins and shower. 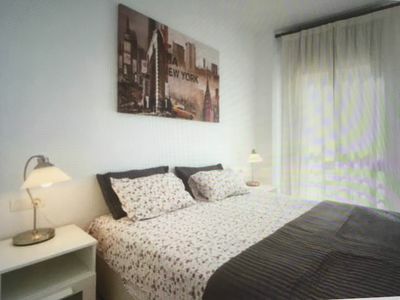 The annex has a large, luxury, hard wood bedroom suite with Super King bed and full en-suite facilities. 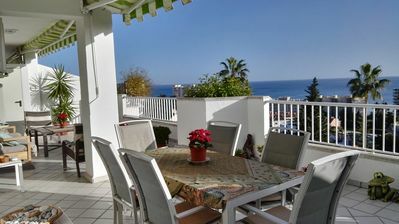 The villa is spacious and well furnished & equipped to a high quality standard. The large lounge/dining room has a centre piece tosca stone fire place. 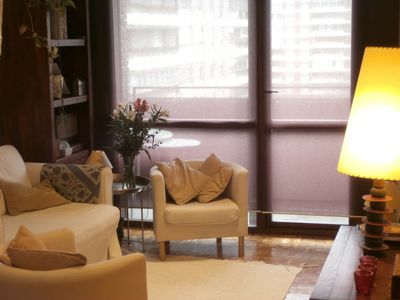 The lounge opens through sliding patio doors onto a large naya with sea views and has extending sun blinds, for that 'must have' shade when the sun is just too hot! The naya has a quality set of table and chairs for al fresco dining plus a separate table, double settee and arm chairs for relaxing and is adjacent to the pool area. ALL bedrooms and the lounge dining room are fully air-conditioned and the property has full central heating for out of season use. 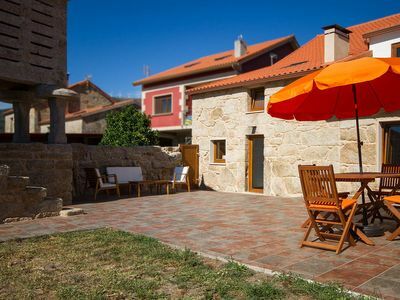 There is a fitted and well-equipped kitchen with new electric oven and hob, upright fridge freezer, dishwasher,microwave, kettle and more cooking utensils than you'll need on holiday! A washing machine and dryer equipment is provided. In the lounge area there is a 40" screen TV with all UK channels including BBC,ITV,C4, C5 etc plus a host of movie and documentary channels etc. WIFI is provided and is very reliable. There are NO additional mandatory fees for any services provided at our villa including air con and WiFi. We will be as accommodating as possible to meet your requirements for change-over dates. Also we will endeavour to supply any special requirements, for example, travel cot/high chair on request.